Welcome to Yoga Uttara School: Land and Heart Practice. You’re thinking about signing up for 200 hours of Yoga Teacher Training. That’s a big decision! We’ll get started in June 2019. Here’s the tentative schedule (details subject to change). a collaborative approach to developing teaching techniques. I call this training Land and Heart Practice as a reminder of our connection to the land. Yoga has been around for dozens of generations. The practice transcends cultures and is practiced by all kinds of people because it teaches a universal truth. We are all connected to the land and to each other. In this program, you’ll examine your relationship to yourself, to others and to the land through the lens of yoga. You will investigate the wheel of yoga, the eight-fold path, anatomy, the poses of yoga, meditation, acroyoga and therapeutic applications of yoga. Yoga is the tool to navigate life and to understand how to manage your journey. The practice is an examination of the spiritual, physical and emotional self and how you relate to everything around you. The intention of yoga is to understand the Self in relation to the self. The Self is the underlying nature of bliss shared with all living beings. The self is the personality, body and mind unique to each person. By understanding that everyone/thing exists in harmony, you can mindfully negotiate your way through life’s ups and downs. Yoga removes the obstacles that keep you obsessed with life’s highs and lows and helps you access your true nature of bliss and calm. Over 200 intensive hours, you will discover how this practice fits into your life and you will define your skills as a teacher. As a teacher of yoga, you will use compassion and patience to guide students toward their own application of a land and heart practice. The responsibility of teaching yoga is enormous, but your commitment to learn about the task is proof of your willingness to take on the task. Welcome to the program. Be receptive to new ideas and acknowledge every teacher. Your commitment to deepen your practice and to teach others is admirable. Peace will guide your way, but be tenacious and determined in your journey. I also have a certificate in community coaching from the National Coaching Certification Board of Canada (NCCP) and a Master’s Degree in Adult Education from Athabasca University. In 2013, I launched my website and blog, Yoga Uttara. 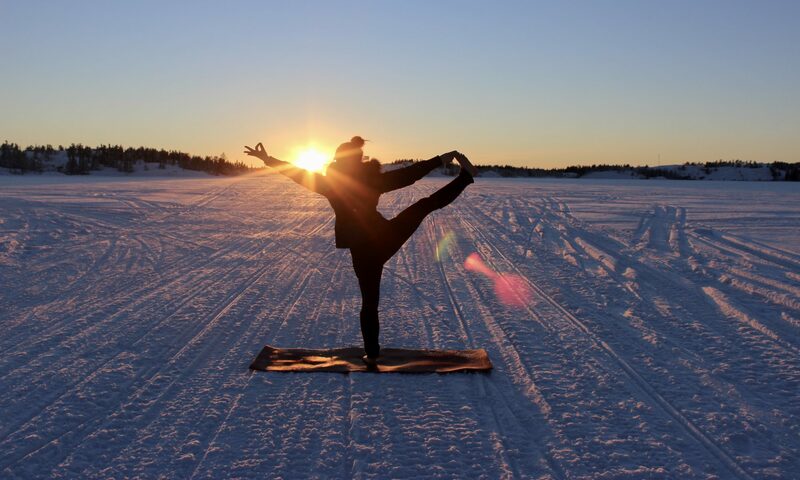 In Sanskrit, Uttara translates to mean “north” or “up.” My home is in Yellowknife in Canada’s Northwest Territories, so describing my yoga practice as “way up there” is significant. Since I started teaching in 2010, I have dreamed of leading a yoga teacher training. This 200-hour YTT is the result of many years of practice, contemplation, teaching and writing. By signing up to be a student of Yoga Uttara School, you will also be a teacher. The practice of yoga is dynamic because it pays equal merit to its history and teachers and its present and students. Every yogi is a teacher and a student. Yoga fits into our lives in unexpected ways and every yogi provides a unique insight into the value of the practice. Collaborative learning will exemplify this notion. Yoga is about mental fortitude, physical strength and steadiness of mind. Practicing yoga provides me with the strength to overcome physical and emotional challenges. Teaching yoga provides an outlet to share my passion. Writing about yoga captures the journey. I am excited to have compiled what I know into a 200-hour Yoga Teacher Training and I look forward to telling my stories and hearing about your perceptions and knowledge of yoga. Previous PostPrevious Yoga, weight loss and the search for compassion.